Andrew Carnegie was a Scottish-American industrialist who led the enormous expansion of the American steel industry in the late 19th century. He was also one of the highest profile philanthropists of his era; his 1889 article proclaiming “The Gospel of Wealth” called on the rich to use their wealth to improve society, and stimulated wave after wave of philanthropy. Carnegie was born in Dunfermline, Scotland, and emigrated to the United States with his very poor parents in 1848. 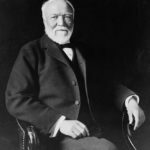 Carnegie started as a telegrapher and by the 1860’s had investments in railroads, railroad sleeping cars, bridges and oil derricks. He built further wealth as a bond salesman raising money for American enterprise in Europe. He built Pittsburgh’s Carnegie Steel Company, which he sold to J.P. Morgan in 1901 for $480 million (the equivalent of approximately $13.5 billion in 2012), creating the U.S. Steel Corporation. "The average person puts only 25% of his energy and ability into his work. The world takes off its hat to those who put in more than 50% of their capacity, and stands on its head for those few and far between souls who devote 100%." "The first man gets the oyster, the second man gets the shell." "Immense power is acquired by assuring yourself in your secret reveries that you were born to control affairs." "The ‘morality of compromise’ sounds contradictory. Compromise is usually a sign of weakness, or an admission of defeat. Strong men don’t compromise, it is said, and principles should never be compromised." "Do not look for approval except for the consciousness of doing your best."